Another Friday, another Bloggers Challenge. This weeks challenge is to use Die Cuts or Templates on your projects. I've got two projects to show you today - one with Die Cuts and one with the Sizzix Box #2 Template. I used the Kind Thoughts Flourish (small) and the Wet Stencil Technique (April TJNL) to create the backgrounds on both my projects. 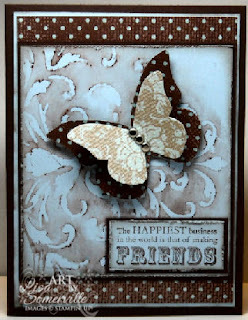 On my card I also used the Butterfly Die to cut my butterflies from the Parisian Breeze DSP, added some silver brads and adhered to the card with dimensionals. 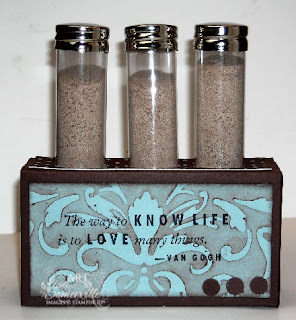 I created a Test Tube Holder with the Sizzix Box (you can see one I previously created here). These boxes aren't really that big, but I thought putting different Cappuccino Mixes in the test tubes worked out great. Gorgeous! I love using the test tubes in the Box #2, too! Great job. Both projects are beautiful. Great minds...on that butterfly, lol! Love the idea of Cappacino in the test tubes. I just added the stencil to my next order and boy am I glad that I did! These are beautiful, Lisa! Looking forward to that newsletter with all of your sneak peeks! I was not going to buy that stencil.....until now!! Oh my word!!! I love both projects, but the card is leaving me speechless (husband says that doesn't happen often)!! WOW!! Gasp! These are both breathtaking! just GORGEOUS! You are the template queen! Wow both of your projects are just wonderful. The card is just divine and your little test tubes looks so cute in that box. wow! Gorgeous! Beautiful! Stunning! What more can I say? I love it! Wow what a cool looking technique, I saw this in the TJ group too and can't wait to try it next month! Love the blues and browns and how they blend on both your items! Beautiful projects, Lisa. The stenciling looks lovely. Both are so pretty. Stunning colours and great ideas. Great projects! Love the colors and the stencil technique!